Protesters in the Mexican state of Guerrero have torched the ruling party's regional headquarters as part of their demonstrations to achieve justice for the 43 missing students who disappeared in September. The attack on the regional headquarters of the Institutional Revolutionary Party (PRI) building in Chilpancingo is the latest violent protest to explode in Mexico over the incident. In a separate incident, protesters also blocked the airport in the city of Acapulco. The protests at the airport began on Monday with thousands of demonstrators blocking its entrance for three hours. 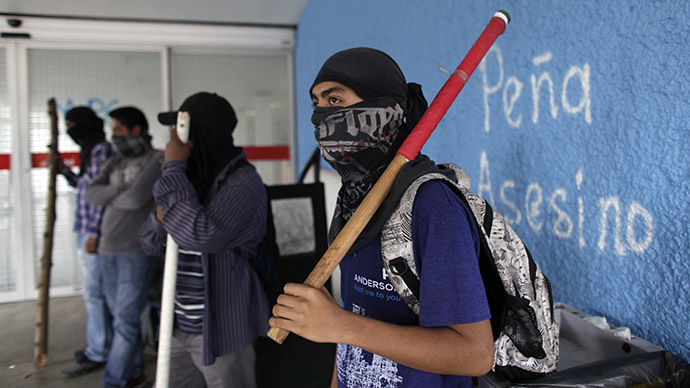 A group of masked protesters, armed with bats, metal pipes and machetes clashed with riot police who tried to block them from getting through to the airport. After negotiations, the police let them through. While the airport was barricaded for three hours tourists had to walk to their planes, Reuters reports. Tuesday's protests come just three days after demonstrators attempted to storm the National Palace in Mexico City, setting the doors on fire after failing to get inside. They were eventually driven away by police, though there were a number of arrests and injuries. The protests stem from the abduction of 43 students who went missing on September 26 in the southwestern town of Iguala. They were detained following a protest in which a group of students clashed with police. They have not been seen since. The recent protests were ignited by allegations from Attorney General Jesus Murillo Karam that three members of the Guerros Unidos gang had confessed to killing the students – which had been handed over to the gang by the police – and burning their bodies. In a setback for those hoping to uncover where the students were killed, the Argentine Forensic Anthropology Team has determined that the human remains found at the mass burial site in Cocula do not belong to the students. According to Telesur, 24 out of the 30 remains analyzed so far “do not have a biological kinship” with the abducted students. The rest of the remains are still being analyzed with the help of the US-based Bode Technology Group. He has now become a subject of ridicule on social media, with slogans like “Enough, I’m tired of Murillo Karam" circulating. The question “If you're tired, what don't you resign?” has also been posted online.